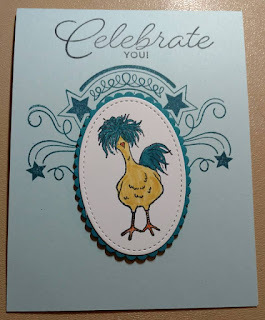 This is my blog where I share things I create with my Stampin' Up products and stamps. I love to make cards, 3-D projects and scrapbook pages. I always love it when a new catalog comes out. And the new 2018/19 catalog is great! There are some absolutely gotta' have new sets in there, I've ordered several already! I got the Springtime Impressions thinlit set and found a little time to play with it. It's a great set! First of all, I used just a portion of the flowers on this card. I water painted the background in the new Merry Merlot and also cut the flowers from that new color. I can already tell it is going to be one of my favorite colors! How do you like that new ribbon? It's a little hard to tell in the picture but it is so pretty. Here is another card with the Springtime Impressions thinlits. The 3 flowers are clipped from a portion of the large flowered piece but the single flower is one of the dies in the set, as is the butterfly. I did the background by scribbling long strokes on the largest clear block with the broad tip of 6 different color markers. Then I spritzed it with water and stamped it onto the card front. I love the delicate touch it gives to the background. 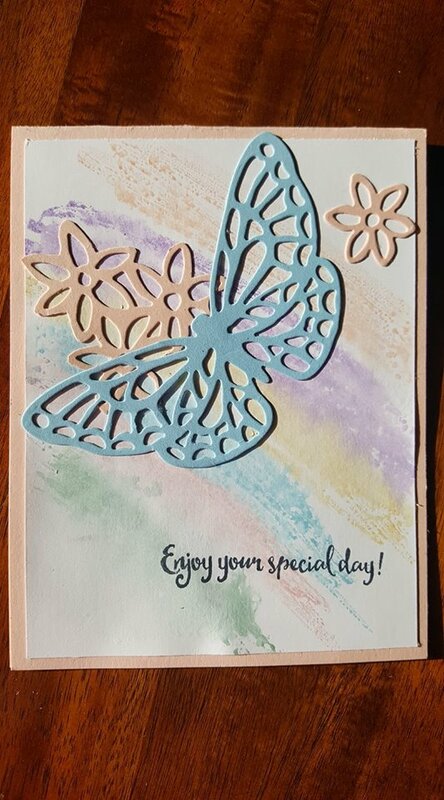 And my last project to share today uses the Springtime Impressions upside down so it embosses instead of cutting the cardstock. 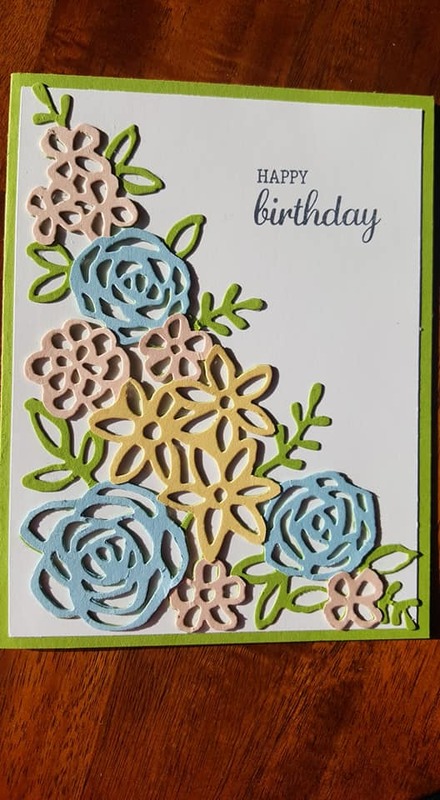 Then I used a few of the leftover flowers from the previous projects and another new thinlet set that says Happy Birthday. It was a quick and simple card since I had the leftover flowers laying around. A Little Wild - It's a lot adorable! I've really been neglecting my blog for a long time! I'll try to be better about it but things are changing around my house so I can't make any solid promises. Part of my excuse is that I spent some time in the hospital after getting a tick borne illness called ehrlichia. It was a horrible illness and I strongly advise against getting it. I've never been so sick in my life. I actually wanted to just go ahead and die by the 3rd day. Then I went to the hospital and was there 6 more days. I feel better physically but my brain is still a bit confused so I've just been trying to take it as easy as I can while it heals. In the mean time, the new Stampin' Up Annual Catalog came out and my very favorite stamp set is one called A Little Wild. I have found a bit of time to play with the set so I have some cards and a scrapbook layout to feature on today's blog post. The stamp set is designed to be small tags, perfect for birthday and baby shower gifts. 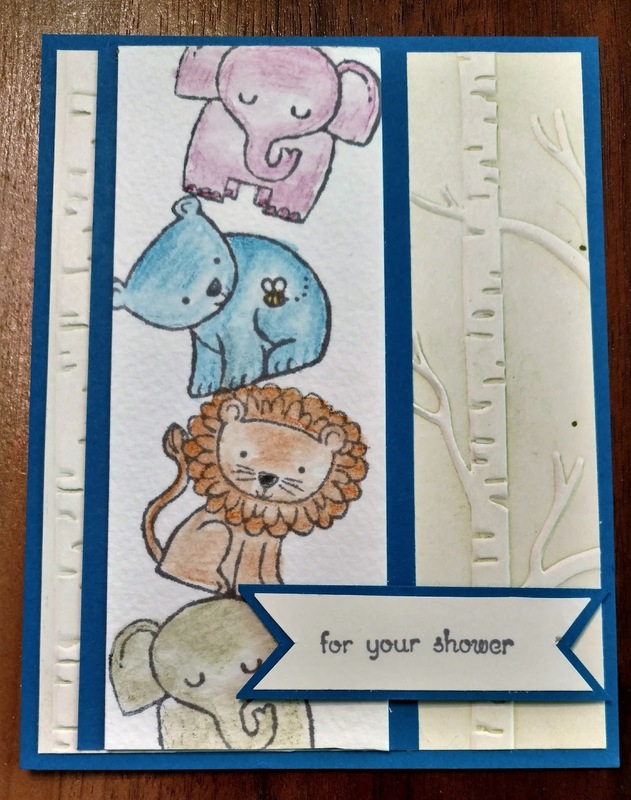 But they can be stamped and used with just the front of the animals like this card. 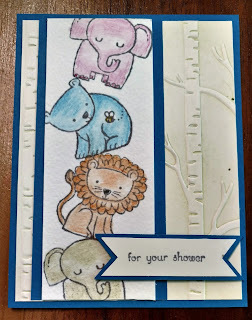 I stamped them on watercolor paper and used the new watercolor pencils to color them in. Obviously, I need a lot more practice with water coloring! I used Pacific Point cardstock to brighten it up some and the Woodland Embossing Folder to add dimension to the background. I've been doing a lot of Christmas cards and treats lately. I have several more craft fairs coming up so I need fun things to sell at those. I got to pre-order from the Occasions mini catalog and the Sale-a-Bration catalog but haven't had much time to play with my new stamps. 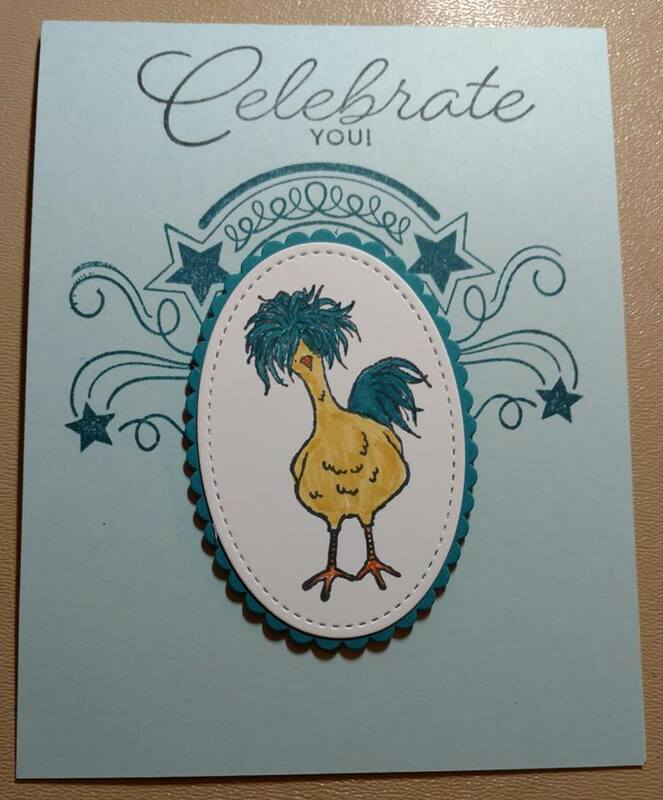 I did manage to eek out a few minutes to create this card with the fun FREE chicken stamp set though. It is a Sale-A-Bration set called Hey, Chick. 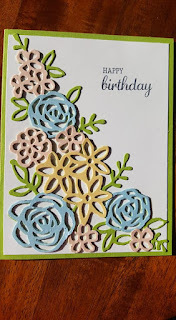 I paired it with a stamp set from the Occasions Mini catalog called Birthday Blast for the background. I need to make a scrapbook page with pictures of my chickens with the cute Hey, Chick stamp set. Will I get time before Christmas? I doubt it! Something to look forward to, huh? As you can tell, this picture was made before Halloween. I've been making cute earrings with the Cookie Cutter stamp set and punch out of shrink plastic. I always used the oven to shrink the plastic but someone said they used their embossing gun so I tried that and it is great! Fast and easy and so much more fun to watch than leaning over the oven door. Hi everyone, I think the blog problem has finally been solved! What a year it has been for me, I wouldn't have had much time to post if my blog had been working correctly anyway. Last June my husband was diagnosed with colon cancer. He had the large tumor and about 10 inches of his colon removed but the biopsy showed that there was cancer outside of the colon also and he had stage 3-B cancer. He didn't want to do chemotherapy so I studied up on natural treatments and developed a program of very clean eating including NO sugar at all because I discovered that sugar feeds cancer. I also made some herbal remedies and used essential oils to fight the cancer. It must have been the right combination because at his year follow up appointment with the oncologist all the tests showed no cancer at all! Needless to say, we are very excited with that news. During this rough year we had a bright spot with the birth of our 7th grandchild. She is such a cutie and we are loving having a baby since our last grandbaby is already a big 3 year old. And our daughter who lived in Colorado moved to East Tennessee so they are much closer to us so we will be driving East a lot now! The first project I made was a fun card for Halloween. I used the small stamps from the Halloween Cookie Cutter stamp set as a background and added a piece of DSP behind the 3 Halloween spookies. I found the idea for the little box online somewhere, I can't remember who to give credit for it. I used the envelope punch board to make the box and then used the reindeer from the Cookie Cutter Christmas stamp set. The fun stamps in the Christmas set were begging me to do a scrapbook page with them. I'm sure I will be making more pages soon. Since Halloween is first I'll soon have pictures of the grandchildren dressed up that I will need to get into my scrapbook. I used the 12X12 Kraft cardstock as a border, cutting out the middle of the sheet to use as mat layers and the stars. 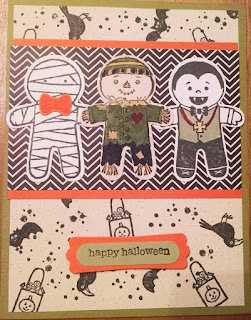 One of the inch wide strips I cut off the Real Red cardstock was used on the right border with some paper from the wonderful Candy Cane Lane Designer Series Paper. One of my favorite projects with these fun sets is the shrink plastic earrings. Aren't they adorable when you shrink them down to the perfect earring size? I just bought the Ruff and Ready plastic at the local craft store and stamped in Staz-on on the slick side and colored on the back with Sharpies or colored pencils. And the skeletons and mummys don't even have to be colored, extra quick and easy! I'm so glad to be back, I hope it continues to work ok because I struggle with computer problems. I'm amazed by what a computer can do but when it doesn't do what it is supposed to do, I'm just lost! Too bad I can't just stamp it back into shape! I think I may have solved the blog problem so I can post more projects. Now to find time to actually stamp! I went to a friend's house who is also a Stampin' Up demonstrator a couple of weeks ago and we had fun stamping together. I CASEd these cards from the hundreds of cards I have pinned on Pinterest. I love being able to have lots of my favorite cards I come across right there together when I need inspiration. All of these cards use the set called "You've Got This". 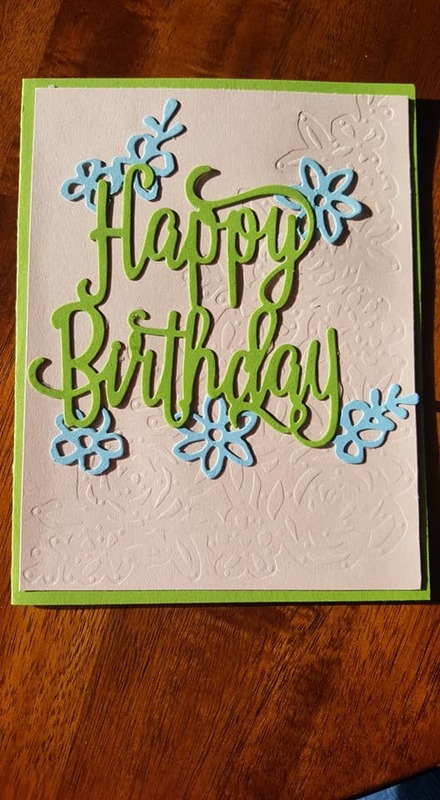 It has a nice floral image, a scribbly cross-hatch type of background and 3 sentiments to choose from. The first card is the only one of these that I used the background stamp on. I think I'll stamp off the next time so it won't be so dark. This card is a fairly close copy of one that Jen posted on stamped silly. I hadn't torn the cardstock on a project lately and I liked her layout a lot. I didn't have the Tip Top Taupe lace so I used the new cucumber crush dotted lace trim. I colored the flower with a blender pen using ink from the inkpad. With no coloring needed, this was a very quick and easy card. I stamped the flower and sentiment in the new Mint Macaroon. The DSP is from the Cherry On Top paper stack. There are some very fun prints in that little stack of paper. Simply Stamping with Narelle. She used the Mint Macaroon striped paper from the envelope paper, a set of thinner DSP-like paper especially made for making envelopes. I haven't ordered any yet but it is great to have a lighter weight paper for the envelopes. Last is a card by Peggy at Pretty Paper Cards. The layout is pretty much exactly the same as her card but I used different Designer Series Paper so it gives the card a different look. Hers was more sophisticated and mine is a bit more fun looking. It just depends on the situation and who you are sending the card to as to which colors you would choose. I like this one also because you can get by without coloring the flowers. Not that I mind coloring but it makes a card come together much more quickly if you can skip the coloring. And since I had to fussy cut 3 flowers for this one I was glad to save the time! Well, let me hit "publish" and see if we can cheer because I'm back in blogland! And I better check the link for my catalog and make sure it works and has the right catalog. I'm sure it is the old one and I'm excited about the new catalog. There are a lot of great new stamp sets in the 2015-2016 catalog! It looks like I'll be able to do a post for a change. I need to figure out what is going on with my blog and fix it so I'll be able to add a post when I want to and not when it decides to let me! Hi, I'm still around! For some reason I haven't been able to get onto my blog to post anything. I've tried to contact someone but haven't gotten any responses. I'll try a quick post today and see if it will work this time. I can't believe it is December 16th! Shoot, I can't believe it is December! I've been super busy and time is just flying by. I don't have pictures of any of the Christmas cards or projects I've been doing but I'll take some and post them if my blog will cooperate for a few days. I bought these little white pumpkins before Halloween and had fun with the grandchildren coloring them. Mine would be the kind of plain one on the right. I was thinking about fixing supper and didn't do as good a job as the kids did. We had fun though. I participated in Project Rudolph this year. Their goal is to get Christmas goodie bags to as many of the soldiers serving in the Middle East as they can, I think their goal for this year was 30,000. We decorated brown lunch bags and made ornaments to put in them. They also put candy in them along with letters, one from an adult, one from a teenager and 2 from children. I got my friends to write letters, something that seems to be a dying art these days! The ornaments pictures above are from the cub scout troop at my church. They made 73 ornaments in all! These are some of the ornaments I made. I didn't make 73 but I think it was somewhere around 30. I need to start earlier in 2015 so I can help out more. Well, I reckon I need to run to the post office to mail a package to my daughter in Colorado. Hopefully I'll be posting again very soon! Wow, my last post was in May! I knew I had been neglecting my blog but I didn't know it was that long ago! It is the garden time of year though and I've been spending a lot of time weeding and watering my garden. The squash, including yellow crookneck, zucchini and butternut are coming in real well. I'll have plenty in my freezer very soon! My tomatoes should be turning red soon (I got them planted late) and the beets, onions, spinach, lettuce, October beans and purple hull peas are doing well too. I love harvesting part of my supper every night! I'll share a couple of the things we made at our Stampin' Up retreat in Birmingham, AL last month. I always enjoy these retreats and we make some amazing cards and 3-D items. It is so much fun to get together and stamp the day away! First is this nice set of notecards in a box for a nice gift. We used the 5 new In-Colors for this project. They are nice colors and I will enjoy creating with them the next 2 years. This cute little project is called a 31 bag. It is very much like the company of the same name's bags but very fun made out of the bright paper from the Sweet Taffy Designer Series Paper. The handle is made from 3/4" Chevron Ribbon, the perfect size ribbon for this project. Here is a view from the inside of the bag. I've got a few more projects and some swap cards from the retreat to share, maybe I'll get them posted soon. I'll try not to wait 2 more months to post again! Although I haven't been inundated with zucchini I have had plenty so I went to Pinterest and found a great recipe for zucchini Blueberry bread that I've made a few times, I think I need to go make another loaf! It is sooooo good! I have made it in a loaf and as muffins. I should have taken pictures but here is the recipe in case you have an abundance of these yummy green veggies too. 1. Preheat oven to 350 degrees F (175 degrees C). Lightly grease 2 8.5 x 4.5 loaf pans. 2. In a large bowl, beat together the eggs, oil, vanilla, and sugars. Fold in the zucchini. Beat in the flours, salt, baking powder, baking soda, and cinnamon. Gently fold in the blueberries, chia seeds and pecans. Transfer to the prepared loaf pans. I ordered 2 sets of the new Blendabilities alcohol markers on my pre-order and have had a little time to play with them. Here are my first 3 attempts to color a flower with them. Can you believe my first attempt was better than my second??? I was basically just coloring with them and couldn't get them to blend. I watched a couple of videos but didn't get the "magic" tip that could make my blending better. Then I was at a friend's house who has had a lot of experience with the other alcohol markers and she told me to just color 1 or 2 petals at a time. I was going over the whole flower with the dark, then the medium, then the light shades. By the time I started on the next shade the previous one had dried too much to blend. Makes total sense but I never thought about it while I was coloring with them before. And none of the videos I had watched had included that tip. It made a huge difference in being able to blend the colors, as you can tell with the 3rd attempt. The coloring was kind of sloppy but you can see that the blending was much better. I still need a lot of practice but I'm more excited about the markers now that I can blend them and have the shading look better. 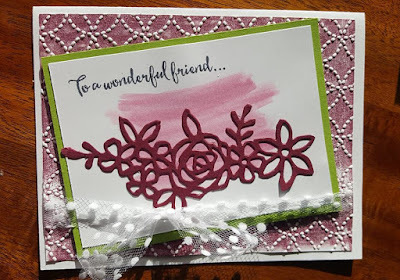 I used the new Blended Bloom individual stamp to stamp the flowers with Memento ink that Stampin' Up has added to it's catalog because it is the best ink to use with the Blendabilities markers. The markers come in sets of 3, a light, medium and dark shade so that the colors will be the right shades to blend well. I used the Coastal Cabana trio to color the flower. 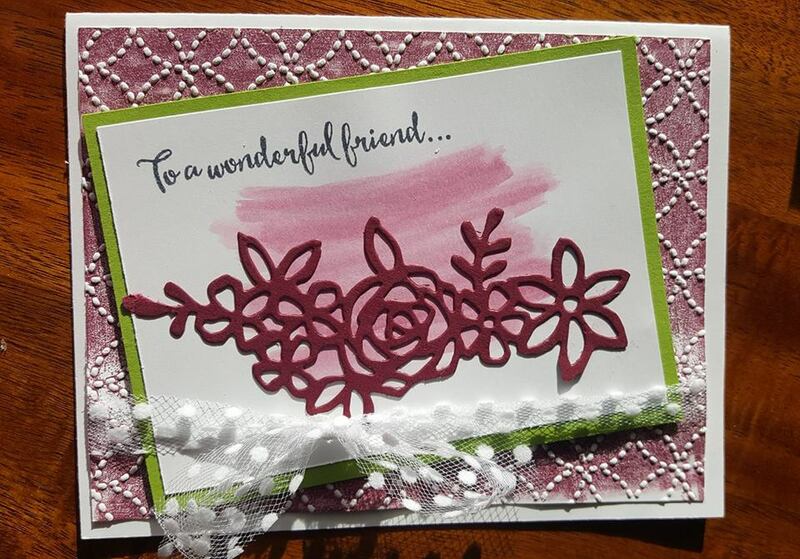 After I got the hang of it I got out a second color set of markers, the Old Olive assortment and stamped up a card front from a new hostess set that will be in the new catalog that will begin on June 1st called Bloom With Hope. It is an 11 stamp set that has 5 sentiments and 6 flower parts. I used the largest flower and the stem and leaves. The Happy Birthday also is in the set. I stamped it a little crooked, it may need some intervention unless I get used to the tilt of it. The blue cardstock and ribbon may look a little unfamiliar to you, it is from the new 2014/15 In Color collection. It is called Lost Lagoon. I love the new Stitched Satin Ribbon that comes in the new In Colors shades, isn't it beautiful? I will be using the other 4 colors in projects soon. They are Blackberry Bliss, Hello Honey, Mossy Meadow and Tangelo Twist. I'm not saying I am now an expert at blending but I am very pleased with my progress. I will get better as I practice and get more experience. I wasn't being all that careful in my practice pieces either so I need to watch the lines more. Another tip I heard was to not color all the way up to the lines because the alcohol ink tends to bleed some. I think I need to pop open the small end more often too so I can get in the smaller areas and tight corners. The new catalog is an amazing catalog, I'm so excited about it! There are still many of our favorite stamp sets from the past in it but there are so many new sets that will be so much fun to add to my stamp collection. I hope to spend more time scrapbooking now. I have neglected my scrapbooks for making cards the past couple of years. Scrapbooking was my original passion but cards are so quick and easy, I have been going with the more instant gratification of seeing my art finished more quickly. It is nice to have lots of cards ready any time I need to send one to someone too. There are 12 color sets of the new Blendabilities markers. The set of 3 sells for $11.95 so that is only $4 per marker. That's better than the regular price of the other brand of alcohol markers in the local craft stores. I was pleased about that. Of course, having them in colors that match Stampin' Up's cardstock is a wonderful bonus! I love not having to struggle to find something to match. There is also a skin tone assortment of 6 colors so you can color anyone :~) I need to get the new Color Lifter pen too, I make so many mistakes! I know this is long so if you don't have time to read just scroll down to the bottom to see a couple of samples with a brand new stamp set. Stampin’ Up is an innovative company and always comes up with creative ways to do things. I’m always amazed when I go to their conventions at all the little fun things they include to make it extra special. They tried something new last month to show the demonstrators the new 2014/2015 catalogs. They had a catalog premier show. The live show was filmed somewhere in California but there were dozens of movie theaters all over the US that the live show streamed to. We were invited to get a ticket to our nearest theater and attend and watch along with the ones able to attend the live event. Pretty cool! The event was on April 28th. I thought one would be in Nashville which is only about 50 miles away but there wasn’t one in Nashville. The nearest ones were all right around 4 hours away, Knoxville, TN; Louisville, KY and Birmingham, AL. I was thinking about going to Knoxville but a friend emailed me and asked if I wanted to go to the one in Birmingham with her. I had been wanting to get to know her better so I went to the one in Birmingham. We left about noon to give us plenty of time in case of traffic or getting lost, etc. We found the theater with no trouble at 4PM. We couldn’t get in till 5 and the premier didn’t start till 6 so we went across the street to a Moe’s we saw there. Yum! We don’t have one here so we enjoyed a nice fresh supper and went back to the theater. We got back a few minutes after 5 so went on in. There were 2 employees at the counter so we went to them to ask where to go for the premier. They told us that because of the weather Stampin’ Up had cancelled it. I’m pretty sure my mouth dropped open. I was having a lot of thoughts going through my head. We had just driven for 4 hours, had a hotel room and most of all we wanted to see the new catalog! I also had some very confused thoughts about how the tornado warnings that Birmingham were under would affect California and wondered if Knoxville was cancelled too. Then they told us the feed would probably be interrupted at their theater so we wouldn’t be able to see it anyway and Stampin’ Up was concerned about our safety so wanted us to find a safe place during the storm. We went back out to the car, terribly disappointed and thinking that if we just headed back home we could get here by 9:00 so we might as well cancel the hotel and go home. There were some other demonstrators getting back in their cars and leaving so they had already gotten the news. Then another car drove up so we decided to go talk to them. As we were visiting and all feeling bad about the cancellation more people arrived. Then we started calling Stampin’ Up asking about it. The person I talked to told me that someone was on their way with the catalogs so we decided to wait for her before leaving. At least we would get to see the new catalog and all the wonderful new stamps and other supplies it contained! Then one of the people we had talked to in the theater came out. She said that the feed was working so we were welcomed to come in and watch as much as the storms would let come through. Yay! We were hoping that we would at least get to see an hour or so of the premier show. At this point I wasn’t even considering tornadoes. So we all went in and got our seats. The person with the catalogs showed up and since nobody knew how the evening would go she handed them out first. I guess all the other demonstrators in theaters across the country without storm warnings had to wait until after the show to get their catalogs. We also got a free stamp set. It was a very versatile looking background set. I liked it but didn’t have a clear vision of it’s many uses yet. That is the set they were using for the projects they demonstrated. Every project they did with it made me love it even more! It is such a versatile set, you will see lots and lots of samples made with it I’m sure. The feed continued uninterrupted except for a flicker when lightning struck nearby. We could also hear the thunder rumbling any time there was a few seconds of silence on the show. We were able to see the video till the end so we were happy about that. Once it was over we drove to the hotel and managed to get into the room just as it started to rain. It wasn’t long until a storm siren went off nearby. It sounded like it was very close. We decided we should turn on the local news and see what was going on. A tornado had hit Tuscaloosa which is about 50 miles SW of Birmingham. There were tornado warnings for Birmingham and all around the area. The storm coverage on the news showed them getting closer and closer to our hotel. And the siren kept going off every 10 minutes or so. I live way out in the country so I don’t usually hear the sirens so this one so close and so often was a bit unnerving for me. I don’t usually stress out over tornado warnings. I just keep an eye on the news and listen for the “freight train” so I can head to the basement if needed. We have a nice safe place down there. Juanita and I put our suitcases in the bathroom along with a couple of pillows to cover our heads with if we had to hop in the bathtub. Each bed had 3 pillows so we had plenty of extras. We slept in our clothes and sat listening to the news and looking at our new Stampin’ Up catalogs. Thank goodness we had that little distraction to keep us from freaking out too bad. I didn’t feel nearly as safe in that hotel room as I do when I’m home. I tried to call my husband but his new cell phone had some kind of problem and wasn’t working. We often have that kind of wonderful timing . . .
One of the roving reporters was at a gas station not far from us. He kept putting his microphone in people’s faces asking them if they were worried. Duh! After they had returned to him several times during the filming the whole place started shaking and pieces of the roof tiles started falling. I had to laugh at the news reporter because he was so scared but didn’t want to show it on camera. It wasn’t funny at all and It was headed straight at me but sometimes reporters can be a bit obnoxious so I couldn’t help laughing at him. I’m sure he was relieved when they turned off the camera and he could get in the back storage room where the customers had gone! When they came back to him a bit later he was showing things that had blown down off the shelves and went outside and one of the gas pumps had been blown over onto a car that was parked beside it. I guess they thought that would be a safe place to park while they sought shelter inside. That was about 10:45. The storms were so close to us. And that infernal siren kept going off! Our area of Birmingham was told to get in our safe place. The tornadoes were less than 10 miles away from us. My daughter who lives in Colorado texted me about that time to ask if I was spending the night in the basement. I told her I wasn’t home, I was in Birmingham. She had seen the news and knew that wasn’t a good thing. I asked her to pray for us. - Then we prayed for us. About 10 minutes later they said the tornado warning had been cancelled! Whew! I could breathe again! We were so thankful for that news. We took off our shoes but slept in our clothes with cell phones and flashlights beside us just in case another storm came along after we turned off the weatherman. Once I fell asleep that was it. I didn’t wake up at all until it was light outside the next morning. This is a trip I won’t soon forget! If you are still reading, thanks for sticking with my long story. Now for what you come to my blog for, stamping! Here are more samples with the Work of Art stamp set. First is a card with a simple background, inked up the swoop stamp once and stamped it 3 times so it is lighter with each stamp. I think it makes a great background for butterflies to fly over! Second is another card with the swoop, this time it is turned like an arch and is rainbow-like. The sentiment and the hearts are also in the Work of Art set. This one was a quick and easy card too. Last is a card I used the technique to ink up the embossing folder before embossing the paper. I used the circle stamp from Work of Art to stamp the white on the Blushing Bride background cardstock. The Thank You sentiment is also in the Work of Art set. I'm glad the Natural Chevron Ribbon is in the new catalog, I love that stuff! $99 Demonstrator Starter Kit! Plus, get a free kit from our new catalogs when you join. Go to my Stampin' Up website to see the new catalog and/or place an order! Find out how you can feel better! I use doTERRA Certified pure Theraputic Grade Essential oils. 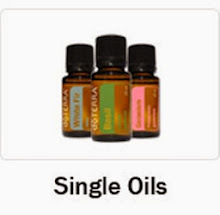 Click on my oil website to see how you can use these great oils too.